Education is hard. I mean REALLY hard. The second most important thing that I’ve learned? We can’t do it alone. I transfered to Springfield High School at the start of my junior year, and by the time I graduated, I could count eight adults in that building who, like our Executive Director Matt Coleman always says, knew my name, knew my face, and knew my story. Eight adults. When I graduated high school and went to college two hours away, my former basketball coach, assistant basketball coach, and athletic director from Springfield would regularly come to watch me play. When I was home for breaks, they let me babysit their kids. They mentored me and supported me as I navigated my first, big life transition from high school through postsecondary. When I look at the Inflexion Approach, it tells me that when I find a school that has a clear Identity, and that identity informs their Structure, which supports student Learning, the outcome is a holistic definition of Readiness for all students. The outcome is students who are lifelong learners, who have the ability to THINK deeply about what they are doing; KNOW contextually why they learn; ACT purposefully to achieve their goals; and GO successfully through life’s transitions. Sound familiar? It does for me, because this was my experience at Springfield. 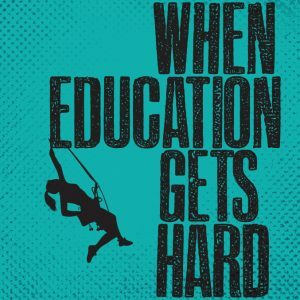 So, in the same breath as I say education is hard and we can’t do it alone, I also say it’s possible, I’ve experienced it, we’ve seen it in our work with schools, and I can’t think of anything more important than to grow a generation of students who are not just college and career ready, but life ready. Some days (most days), going back and forth between hanging out in a classroom teaching middle school students, to working in an office in downtown Portland creating material, to assisting schools wherever they are in the Inflexion Approach, to sitting in a different classroom as the student, is taxing. And it’s not simply the juggling of responsibilities — it’s the part of lifelong learning that involves learning about yourself. And one of the things I’m discovering is that there’s a huge pattern here. As my educators came alongside me, the Springfield Educational Foundation (the nonprofit that gave me that award) was coming alongside my educators. Right now, I get to sit at every seat in that equation: student, almost-educator, and support for the educator. What I’m discovering from this vantage point, is that I love to be the educator that comes alongside students and empowers them and creates opportunity for them the way that teachers and administration at Springfield High School did for me. Someday, that’s likely where I’ll be. But right now, what a profound appreciation I’m gaining for the organizations like Inflexion, that support and mentor and guide educators, as they do the hard work of empowering kids. So, whatever role you find yourself filling in the vast world of education, we hear you when you say it’s hard. We do what we do because we know none of us can do it alone, and we believe, like you, that there are few things more important than preparing our students for the future.